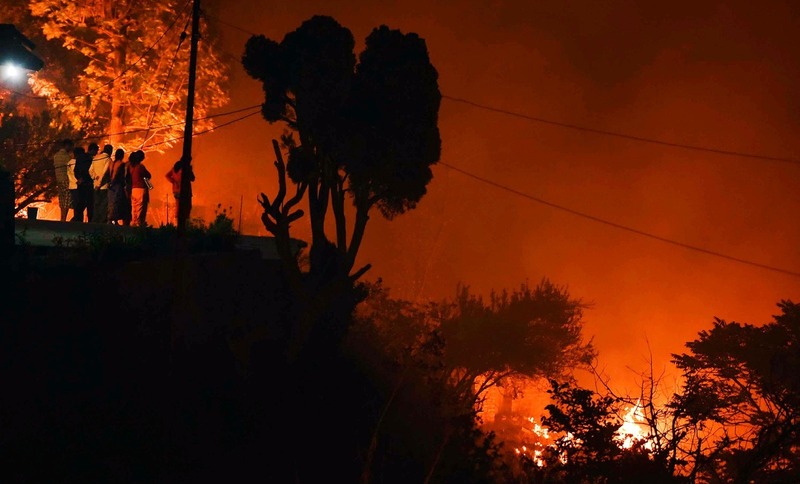 Due to high temperatures fires across Himalayan state of Uttarakhand have burned more than 2,300 hectares of forests and killed six people. Officials says due to increased intensity this year forests being drier as unexpectedly high temperatures and low rainfall in the last two years. Others have said that the fires were started illegally by timber traders. The National Disaster Relief Force (NDRF), the Indian army, Air force and 6,000 fire-fighters are involved in the efforts to save the forests. The fires had spread to 13 districts in the state of Uttarakhand such as Rudraprayag, Pauri, Tehri, Pithogarh, Nainital and Almora. There were also reports of blazes surrounding two major tiger reserves, Corbett National Park and Rajaji National Park. Indian air force helicopters have been spraying water from the region's lakes such as Bhimtal, but were hindered by poor visibility caused by dense smoke. The Indian government is now using a satellite-based fire alarm system that will send alerts to authorities every time a new fire is detected.